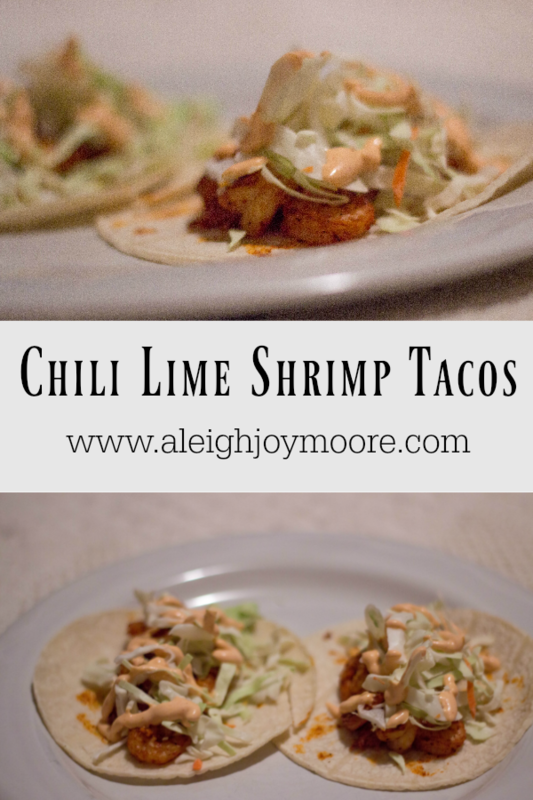 Tasty Tuesday: Chili Lime Shrimp Tacos | For the Joy of Life. Chili Lime Shrimp Tacos it is! But for real, I should've had this up about 2 hours ago, but my eyes are glued on this election! Being from San Diego, I'm a huge taco fan! In fact, our favorite place was actually called Mr. Taco! 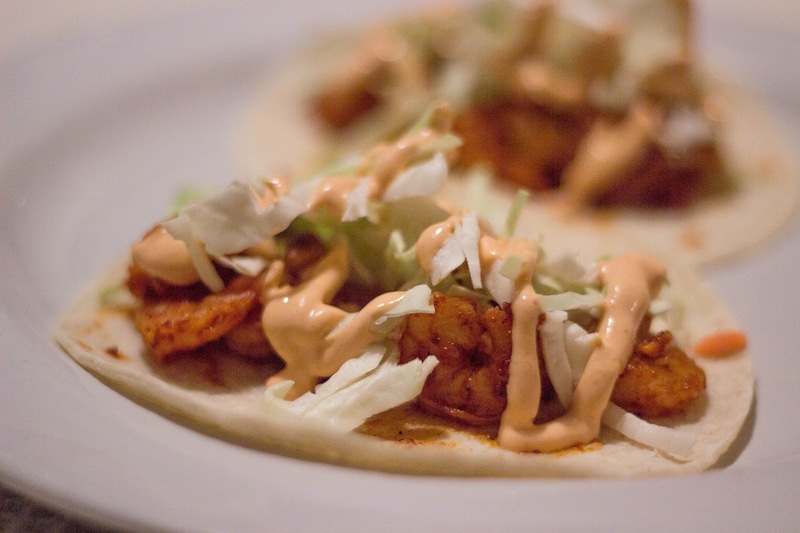 One thing I always got there was their shrimp tacos. While I'm not a huge fish lover myself, I have always loved shrimp! I have decided I want to be more adventurous and create more recipes with it rather than just ordering it at restaurants. I added this chili lime shrimp to corn tortillas to make tacos... but seriously I was just snacking on the shrimp alone all night! I absolutely love the combination of flavors. 1) Make sure your shrimp is defrosted. Mine was not and I ran it under warm-ish water in a strainer for a few minutes. 2) In the mean time, chop your garlic and get seasonings ready. Add butter to a skillet over medium heat. 3) Add garlic to butter once melted and give a quick stir. After peeling, add your shrimp and cook until pink in color. Once cooked, toss your shrimp with spices to coat. Add more to taste. (I'm telling you though, you're gonna want to go with the Mexican hot chili powder!) Remove from heat. 4) Heat up you corn tortillas. 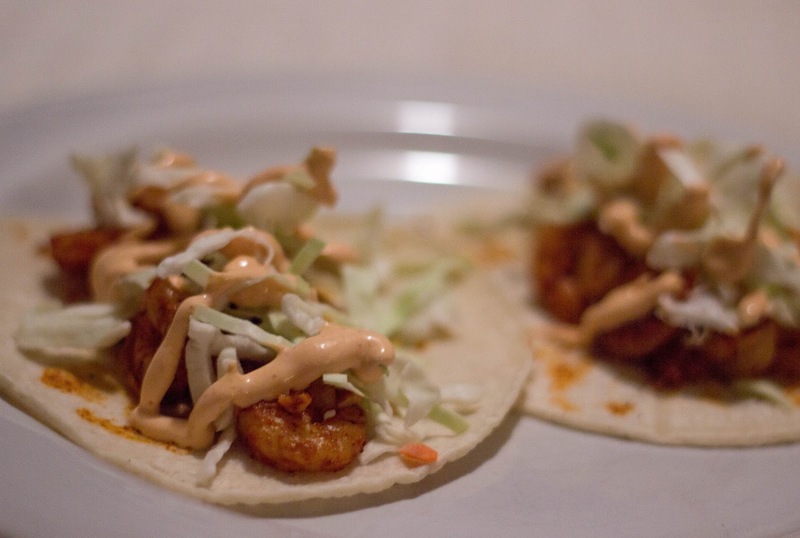 Add a few pieces of shrimp, then fresh cabbage. 5) In a small bowl mix together about a 1/4 cup sour cream and a tbsp hot sauce. 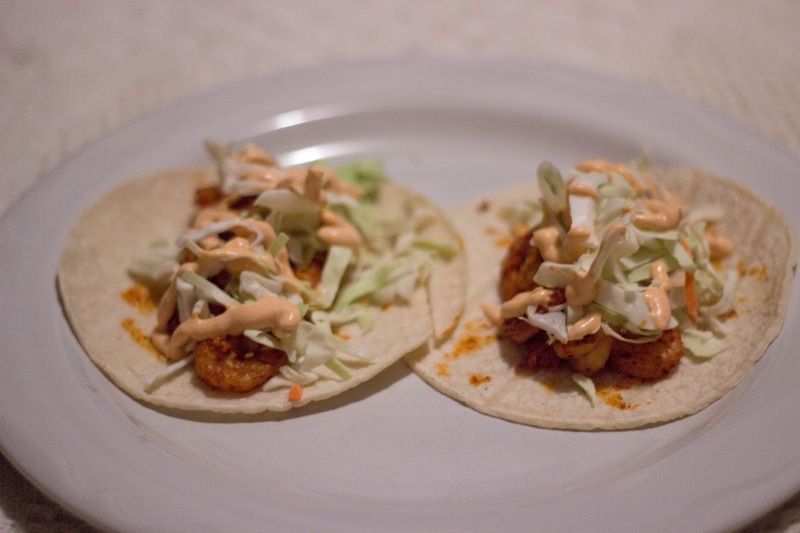 Add to the top of your tacos. You can also add some other fun toppings but I think this simple combo is perfect! Serve with some Mexican rice, refried beans, cotija cheese, and enjoy! That's it! It's such an easy recipe but sure packs a punch! Next week get ready for some cranberry mousse!